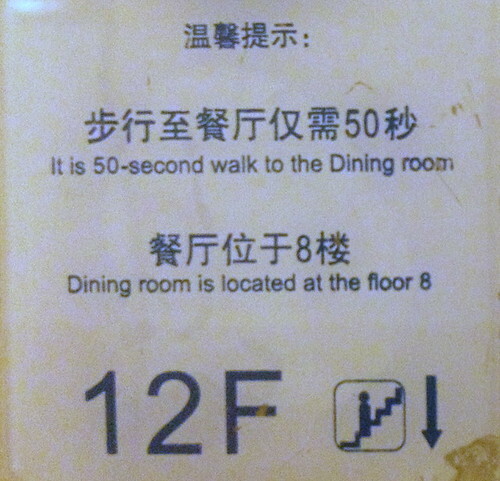 This was pasted on the wall between the elevators, above the buttons in my hotel that I am presently staying. There is breakfast provided everyday at the 8th floor and I felt this sign to remind us to get a bit more exercise via taking the stairs is a good idea. As you can see from the state of the sign, this hotel is pretty run down. The rooms however, is still pretty decent although hot water takes a long time to come on and the toilet roll holder is above to fall off the wall. Still it has decent air-conditioning, clean sheets and free Wi-Fi. Speaking of Wi-Fi while it is complimentary, VPN access is blocked which means that I am destined to be locked within the Great Firewall of Ch1na. Fortunately, my alternative solution of Freegate software managed to get me tunneled through. I should be staying here for at least a week as I go apartment hunting which, frankly speaking, I am dragging my feet coz I doubt if I can find any decent accommodation now that my budget got slashed. Again.